In the 1970's, NASA commissioned the creation of a variety of space habitat studies. Very nice artistic renderings were also made. And now you can view them online. "The City of Space is in a cylinder," Captain Smith said. "Roughly five thousand feet in diameter, and about that high. it is built largely of meteoric iron which we captured from a meteoric swarm making navigation safe and getting useful metal at the same time. The cylinder whirls constantly, with such speed that the centrifugal force against the sides equals the force of gravity on the earth. And who was the first person to think of the idea? You'll have to follow the link to find out. The NASA site has about fifteen pictures in all; you get your choice of cylindrical, toroidal and Bernal spherical. 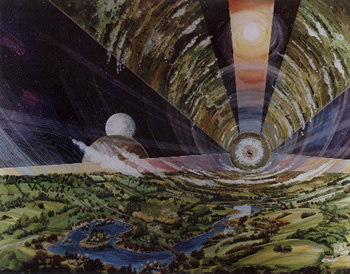 See more space colony images; found the link at VCTB.